The concept of Smart Homes has made our living spaces more interactive and responsive to the needs of users. Home Automation not only helps to reduce the complexity of managing all your electrical appliances within your home, but also give a personalised feel of living as per the daily routine of the user. The Home automation concept covers a wide range of functionality right from operating your lightings, your home security, easy opening of your garage doors, instant availability of coffee as and when you need it and almost everything that comes across your daily activities. The beauty about Home Automation is that is brings the entire control of the house over the tips of the finger and the sensors are smart enough to take self decisions based on any sorts of natural events and surrounding environment. For e.g. if there is enough rain throughout the day in your city, the water sprinklers present in your garden will sense the soil moisture and not sprinkle unnecessary additional amount of water that day. Also, the smart lights within your house can adjust the temperature based on the availability of the surrounding natural brightness. Lets us have a better understanding of what all devices can be included as a part of your Home Automation system. The controllers or the hub as we refer to is the heart of the Home Automation system. All the sensors of your Home Automation system communicate with the controllers over several wireless protocols like the ZigBee, Wi-Fi, Z-Wave etc. The controllers first register the input command received from the users to perform some particular action and then sends the command to the respective sensor to perform the desired action. In nutshell, the Home Automation Controller/Hub is the mediator between the user and the sensor units and holds all the sensors together within an established network. Most of the controllers available in the market today use the ZigBee HA 1.2 protocol which is the mostly widely used protocol for Home Automation. The controller establishes a wireless ZigBee network across the specific range of installation and all the sensor configured in this range will work in co-ordination with the controller. Similarly the Z-Wave and the Wi-Fi based controllers establish the respective networks and control the respective sensors configured within that network. In order to offer cross compatibility across different kinds of Home Automation devices working across various protocols, most of the companies prefer controllers that work on all of these protocols. Also to ensure the remote operation services, the controllers also work on cloud networks so that user can operate his/er Home Automation system even from a distant location by sending the command to the controller over the cloud network and thus perform the necessary action at the desired location. In Home Automation system, there are a lot of smart light solutions available today in the market. The concept of Smart Lighting can be implemented in several different ways either through In-wall Modules or Smart Bulbs, through smart switches or even smart plugs. In-Wall Modules or Smart Bulbs: The in-wall modules or the smart bulbs come with built-in sensors that lets users talk to the smart lights either through a smartphone app interface or via remotes. For e.g. the RGBW LIFX bulbs available in the market come with built-in Wi-Fi modules which connects directly to your home Wi-Fi networks and receive the commands of brightness control, color control etc. through its dedicated and triggers the necessary action as per the user needs. Similarly, the RGBW LED strips can be configured with sensor units like Ballast which in-turn communicates with the central controlling unit and gives users the control to adjust the strips lights. Smart Switches: Today, there are various kinds of smart switches available in the markets which run mostly on Z-Wave and ZigBee protocols. Smart switches are specifically useful in case you don’t want to change your lights or bulbs but still want to have a remote access/control over your home lightings. The smart switches will replace your conventional switches and then can be controlled through the respective apps of the switch companies or remotes. Smart Plugs: The use of smart plugs is basically done for side table lamp shades and similar applications. The smart plugs consist of a ZigBee operated relay module inside which as per the command from the smartphone either allows or cuts-off the electrical supply. Apart from lighting, smart plugs has its applications in geyser switches as well as in any electrical plug from where you want to turn on/off your device. Smart security plays one of the most important roles in Home Automation. The concept of smart security in Home Automation extends to various kinds of sensors and devices covering almost every aspect of your smart home. Let us discuss few of the widely used devices/sensors in smart security. Motion/Arrival Sensor: Motion sensor are basically used in smart security to detect any intrusion taking place at your home when you have left for work. Once activated, the motion sensor will let inform you through SMS, calls or other notification ways as soon as it detects any unwanted movement within its range. Apart from security, the other applications of motion sensor include triggering the lights of your path ways as soon as you enter your home in the evening. Door/Window Sensor: These sensor are usually installed at the door and the windows framing. The door/window sensor basically consist of two parts- one magnetic and one electric. Either of the parts can be placed on the frame and the counter part of the door/window itself. These type of sensor can soon notify users when any intruder breaks through their doors/windows. The door/windows sensors can also be used to turn on your living room lights as soon as you open the main door of your home after a tired day at work. Apart from just lightings, the main door sensor can also be configured to perform several other activities at once. Alarms: The Alarms in the home security system is basically siren which receives the signal from the main hub/controller unit to get activated in case and intrusion detection takes place. Cloud based alarms can be helpful for remote triggering of alarms and similar applications. This means in case and intrusion takes place in your office, you can still trigger and cloud based alarm located at your home. Smart Wireless Bells: Smart Bells play an important role of your smart home security. Today most of the smart bells available in the market come with built-in camera along with motion detection feature. This means that whenever comes to the close proximity of your your main door, the smart bell will send you alert notifications on your phone. Even if you are in remote location, you can quickly turn on the smart bell wireless IP camera and know who has paid you a surprise visit. 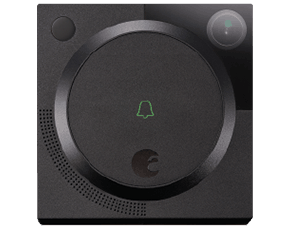 Most of the smart bells available in the market today can be configured to your home Wi-Fi network and the wireless built-in camera lets you monitor your home even from distant locations. Also, few of the smart cameras feature a two-way-talk audio facility and you can talk to the person at your door even sitting at remote locations. This way you can ensure that you do not skip any important deliveries even when you are not at home. Smart Door Locks: Door Locks in smart security come with built-in modules which receive wireless ZigBee and Z-Wave commands and help users to perform keyless operations from locking and unlocking the doors. Users can give lock/unlock the doors sitting at a distant location and gives access to their homes to their dear ones. Security Cameras: The most important part of smart security cameras is the remote monitoring feature they offer. The IP based smart wireless camera gets configured to your home internet network over Wi-Fi and can stream live video to user sitting at distant location. Few smart cameras also have the additional motion detector sensors and notify the users soon upon any kind of movements noticed. Speakers/ Audio Distribution: In addition to lighting and security, the Home Automation system also caters to your various entertainment needs within your home. Today, some of the famous sound enhancement famous companies like BOSE and SONOS make HiFi Wireless speakers for distributed audio throughout the home. This means that you can listen to the same audio across the speakers in all your rooms. Video Distribution: Similarly, just like distributed audio, you can even distribute video in Home Automation. By distributed video we mean a single video source like a BlueRay Movie or a Satellite TV can be shared between multiple TVs. This reduces the cost of having multiple satellite TV connections. Also, to get distributed video, you can make use of Home Automation Roller Shutter screens. Virtual Personal Assistant: Some of the entertainment devices in Home Automation are even interactive and responsive. Like for example you can literally talk to the Amazon Echo and gets tasks done like turing on/off lights, locking/unlocking smart locks, play your favourite music, trigger scenes etc. There are various kinds of climate control sensor available today in the market for Home Automation. The climate control sensors in Home Automation are available in the form of temperature and humidity sensors. These sensor by detect the heat and the moisture content within the air and take necessary action like turn on fans/ACs when the temperature crosses it cut-off values. Similarly, thermostats play a major role to maintain stable temperature in your desired applications. The thermostats monitor round the clock temperature at the place of installation and ensure that the temperature is maintained at the desired level. The thermostat takes the necessary action by turning on/off the devices to wither heat or cool. Thermostats are used in variety of applications like centralised cooling/heating, ACs, refrigerators, ovens etc. Flood/Fire Sensors: Flood or Water Leak sensors are very useful with higher water usage areas like near the dish washers, under every sinks, or in sensitive areas with pipe leakages of your home. These sensors will instantly notify users about any possible water leakage and help them to take proactive measures thereby preventing any further major kind of damages. The flood sensors can also be used in garden areas to stop the water sprinklers in case excess water has been poured. Similarly, the fire or smoke sensors are useful in kitchen areas of your smart homes. In case of accidents, these sensors will quickly notify the users and help them to take immediate action. In case of fire detection, you can quickly turn on the water sprinklers in your place and prevent from further damage taking place. Some of the Automation devices available in the market have even managed to grab office spaces and cabinets. Few automation machines like smart coffee machines will brew your coffee as the instant of your touch and even on your scheduled time. Similarly, automated biometric sensors can help you get easy attendance to your office and avoid the chance of any false inputs for attendance. Also, in medical sectors, various fitness and health monitoring gadgets keeps a check of your calories burnt and sugar levels in the body thereby assisting you for the required food intake. Not only these, the devices also upload your daily fitness data to let your family doctor know about your fitness schedules and thus help you in getting personalised guidance.